Our company is a professional plant in producing aluminum alloy profile and aluminum wire, and also the processing enterprise appointed by Tianjing Aluminum Alloy Plant. 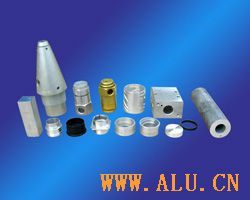 With powerful technology and advanced production equipments, always concerning the needs from customers first, we are able to produce many products of various specification, including aluminum alloy profile, tube material, hard aluminum alloy stick, electronics, industrial profile, radiator, etc. They are made of fine aluminum material, and produced in a standard way required by the country. Due to the high quality, reasonable price, considerate service and reliable credit, our products are sold Tianjing, Beijing, Hebei, Shandong, three northeast provinces and other countries containing Japan, Korea, Candana, etc.